As the announcement of UCLA’s apparel deal nears, here’s a look at the five richest deals in the nation right now and how UCLA compares. Ohio State leads the pack with its 15-year, $252 million deal it signed in January, followed by Texas, Michigan, Notre Dame and Cal. 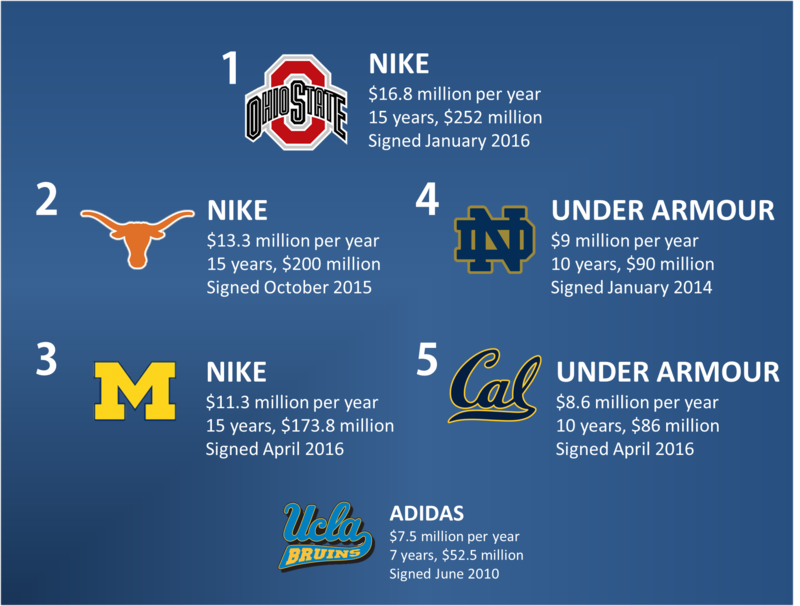 Correction: Wisconsin’s 2015 deal with Under Armour was worth $96 million over 10 years, putting it ahead of both Notre Dame and Cal. UCLA, which is expected to drop Adidas and sign with Under Armour, according to Scout.com, had one of the top contracts in the nation before this year. The seven-year extension signed in 2010 was is worth $7.5 million, however Ohio State, Texas and Cal all inked new deals this year that dwarfed UCLA’s. Michigan dropped Adidas and agreed to a 15-year deal with Nike worth up to $169 million in July 2015, but the final number increased to $173.8 million by the time the two parties signed on the dotted line in April 2016. The much beloved Darren Rovell of ESPN is reporting UCLA’s new deal with Under Armour will span 15 years at $280m. That would be some coin and be the largest deal ever…for now. Go Bruins!